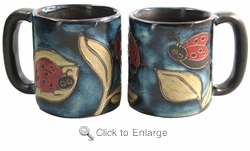 This Mara Stoneware Mug 16oz features the cute Ladybug on a plant leaf. The Ladybug is a favorite insect of most people. This Mara Coffee Mug would make a great gift choice for the gardener in your life.